For superior shade sails on the Sunshine Coast, request Rainbow Shade! 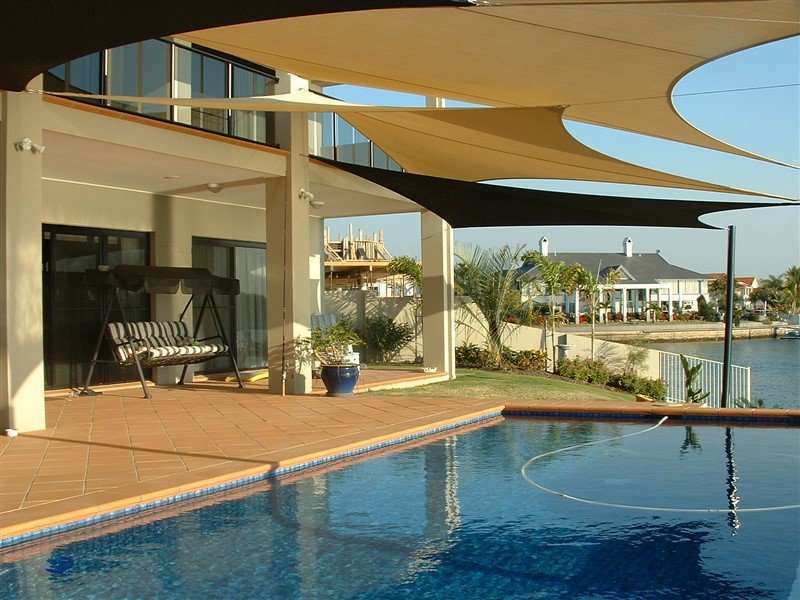 Shade sails are very popular on the Sunshine Coast and can be used in a variety of domestic and commercial applications. While you can easily purchase shade sails from your local hardware store at a very low price, it is important to realise that low price produces low quality. These shade sails have a low warranty and are only suitable for a few applications. Moreover, they require high maintenance and are simply not worth the effort. Thankfully, you can also find superior grade shade sails on the Sunshine Coast, such as those manufactured using one of Rainbow Shade’s fabrics. Our shade fabrics are used by shade sail manufacturers across Australia to create high quality, custom shade sails. Such shade sails can easily withstand natural elements and can last up to 10 times longer than their cheaper counterparts can. Continue reading to discover the shade fabrics options you have when purchasing custom shade sails on the Sunshine Coast. At Rainbow Shade, we supply shade sail manufactures with three shade cloth fabrics that are ideal for both residential and commercial shade sails on the Sunshine Coast, namely eXtreme 32, Z16 and DRiZ. Additionally, we also offer a waterproof PVC fabric, Mehler, which is best suitable for larger commercial applications. EXtreme 32 is an incredibly robust, tear resistant and long lasting fabric that is ideal for shade sails on the Sunshine Coast. Made out of high quality 320gsm fabric, it offers excellent UV-R protection of up to 95.8%. This fabric features dimensional stability, is fire rated and requires very little maintenance. eXtreme 32 is best suited for shade sails spanning commercial applications. Such shade sails are often used for schools, car parks, public pools and across the Sunshine Coast. As a mark of high quality, we back eXtreme 32 fabrics with a 10-year warranty. Z16 is the world’s leading shade cloth fabric. Launched back in 1995, Z16 has revolutionised the shade fabric industry and is one of the most popular shade sail fabrics on the market today. Z16 is a 200gsm fabric and offers UVR protection of up to 99%. This makes it incredibly lightweight, versatile and highly dependable. Z16 shade sails on the Sunshine Coast are used across several applications, including pool shades, car parks and schools. Available in a choice of 22 designer colours, we back our Z16 fabric with a 10-year warranty. DRiZ is an extremely popular fabric choice for Sunshine Coast residents looking for waterproof shade sails because it offers protection from the sun, rain and wind. Featuring a unique waterproof coating, DRiZ features high tensile strength and offers unmatched UV-R protection of up to 100%. DRiZ is manufactured using top grade 280gsm fabric, which makes it incredibly lightweight. It also comes in a range of colours to ensure you can have a shade sail manufactured to blend in with your applications existing colour palette. As a high-quality fabric with proven durability, DRiZ is commonly used in the manufacturing of both residential and commercial shade sails on the Sunshine Coast. Such shade sails are often used to cover pools, playgrounds and outdoor entertainment areas. However, when it comes to heavy-duty commercial applications, our waterproof PVC fabric, Mehler, simply cannot be beaten. Mehler has seen over 60 years of development and this makes it the best choice for commercial shade sails on the Sunshine Coast. Mehler is tear-resistant, highly tensile, strong and exhibits proven longevity and durability. Moreover, it is flame retardant, fungicide treated and incredibly easy to maintain. This UV stabilised fabric finds use in commercial shade sail applications including blinds, canopies, awnings and permanent tension membrane structures. We offer a limited 10-year warranty on this waterproof fabric. Why request our fabrics for your Sunshine Coast shade sails? If you’re looking for superior shade sails on the Sunshine Coast, you cannot go wrong in choosing a Rainbow Shade fabric as your chosen shade sail fabric. We are one of Australia’s finest suppliers of shade fabric for shade sails. We have been supplying high quality fabrics to shade sail manufacturers on the Sunshine Coast for over 30 years now. While our fabrics exhibit the highest grade of quality, our professionalism and service is what makes us highly sought after. With years of experience under our belt and a great reputation behind us, you can count on us to deliver. To start the process, get in touch with us and we will put you in contact with your closest Rainbow Shade partner. We supply our fabrics all across the Sunshine Coast. Wherever you’re located in Alexandra Headland, Battery Hill, Buddina, Caloundra West, Castaways Beach, Coolum Beach, Diddillibah, Eumundi, Golden Beach, Little Mountain, Marcoola, Marcus Beach, Mount Coolum, Mountain Creek, Nambour, Noosa Heads, Noosaville, Peregian Beach, Twin Waters or Woombye, you can rest assure knowing there will be a shade sail manufacturer that uses our fabrics close to you.